A dispute between the Museum of Fine Arts and an Austrian woman who says she is the rightful owner of a coveted 1913 oil painting escalated this week, with the MFA filing suit in federal court to retain ownership of the work. 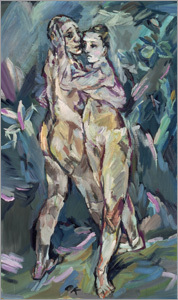 Lawyers for Claudia Seger-Thomschitz, the Austrian woman, say there is no doubt that the painting by Oskar Kokoschka, "Two Nudes (Lovers)," was sold under duress by Oskar Reichel, a physician who ran an art gallery in Vienna during the Nazi occupation of Austria. One of Reichel's sons designated Seger-Thomschitz as his "select niece and designated heiress," according to her lawyer, John J. Byrne Jr.
Of the Reichel family, which sold the painting in 1939, Byrne said: "These people went through the tortures of the damned." In filing suit, the MFA is one of a handful of American museums seeking to establish ownership of disputed works through the court system. The MFA took that route after its curators made a 90-minute presentation Tuesday to Byrne and Thomas J. Hamilton, a pair of Washington, D.C.-based lawyers representing Seger-Thomschitz. The lawyers first approached the MFA in March to ask that the museum return the painting, which is on display in its European galleries. Drawing upon months of research by Victoria Reed, curatorial research fellow for provenance, the museum laid out an ownership history for "Two Nudes" that it felt made clear the work was sold by choice, not under pressure by the Nazis. The 1939 sale was described by the MFA as voluntary and the museum stated that it was made to another Jew, Viennese art dealer Otto Kallir. "The painting was never confiscated by the Nazis, was never sold by force as a result of Nazi persecution, and was not otherwise taken from Dr. Reichel," the MFA complaint stated. Ori Soltes, cofounder of the Holocaust Art Restitution Project in Washington, D.C., said he was impressed by the museum's research. "It strikes me the MFA's case has a lot of merit," Soltes said. But Seger-Thomschitz's lawyers said they intend to respond to the MFA's lawsuit. "We disagree with them in the most important part of this, which is that there was immense persecution of this family that compelled them to sell this painting," Byrne said yesterday, after reviewing the suit. Upon the 1939 sale, the painting and four other Kokoschka works were sent to Paris, where Kallir had moved. In 1945, he sold the painting to another dealer in New York for $1,500. It was purchased by Sarah Blodgett in the late 1940s. She gave the painting to the MFA when she died in 1972. MFA curator George Shackelford called the nearly 5 1/2-foot-tall work special. In violent brushstrokes, the dark portrait depicts Kokoschka himself with Alma Mahler, wife of composer Gustav Mahler, with whom the artist had an affair. Shackelford said it is one of the four or five most important German and Austrian expressionist paintings in the museum's collection. Over the last decade, Kokoschka paintings have sold at auction for as much as $1 million. Shackelford pointed out that the MFA has returned works in recent years that were determined to have been taken from their rightful owners. Those include antiquities sent back to Italy; a panel painting, "Virgin and Child," plundered during the Warsaw uprising of 1944; and "Adoration of the Magi," a painting a Parisian family lost ownership of during World War II. Lawyers for Seger-Thomschitz were not impressed. In an interview yesterday, they argued that the MFA is ignoring the historical context of the Reichel sale. The Nazis occupied Vienna in early 1938. Over the next year, Reichel was forced to sell his gallery and close his medical practice, they said. Two of his sons left Austria. A third son, Max, died in a concentration camp. Reichel's wife, Malvine, was deported to a camp during the war but survived. In 1943, Reichel died in Vienna of natural causes. "If you take away somebody's livelihood, you can't practice your profession, where are you going to get money to live on?" Hamilton said. "It's a 70-year-old man and his wife trying to get by in a milieu of intense persecution." Katherine Getchell, the MFA's deputy director, disputed that yesterday. She said Reichel had not been practicing medicine for years. "Would you also say that people who sold things [during] the Depression, yes, they sold them under duress?" she said. "Yes, if somebody sells their house now because they can't meet their high mortgage payment, is that a forced sale of a house? I think it's very dangerous to make the supposition that everything that happened during a period of time was forced." Nazi-plundered works were hard to trace after World War II. They were often passed from dealer to dealer, with ownership histories wiped out, and sold to collectors or placed up for auction. Stolen art ended up in the collections of many important American museums. It wasn't until 1998 that museums began to seriously consider examining whether works in collections had been stolen. In the last decade, pressure from the international community and a slew of filed claims have led to the return of some pieces. This has lately led some museums to file preemptive lawsuits to establish a claim to work that may be disputed. "This is a tactic of the museums, but it doesn't really get to the issue of the merits of these cases," said David J. Rowland, a New York lawyer who has represented claimants who were sued by the Toledo Museum of Art in 2006. Rowland reviewed the MFA's complaint and said that Seger-Thomschitz has a very strong case. "It's clear the family sold it in the period the Nazis were in control," said Rowland. "Experts in this area know that this is the time when property was being taken away." Other Holocaust art restitution specialists disagreed after reviewing the complaint. "It certainly seems that the museum has been sort of thorough in examining the facts here," said Sarah Jackson, historical claims director for The Art Loss Register. Your View Who is the rightful owner of the painting?